It has been one of those typical Seattle winter days. Liquid sunshine had come down all day long, sometimes pelting, sometimes a mere mist. Then, just before sundown, it cleared. I got about 20 minutes to make some images before it started again. 4/5 second at f/13, ISO 640. Nikon D800E + Nikkor AF-S 24-120mm f/4. it’s so beautiful and moody Ray! Thanks, Marina! That’s exactly what I was trying to convey. Hope all is well with you! 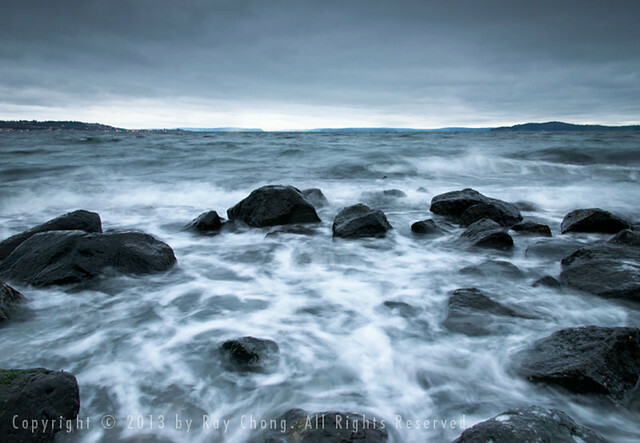 That is very moody – I love how the water feels so alive! Beautiful image. I was lucky that evening. Thanks, Karen.